There was a time when metal roofing was reserved largely for commercial buildings. The hefty price tag created a situation that wasn’t feasible for most homeowners. Recent trends have made metal roofs a very popular choice. Advances in the materials available for use have added diversity, offering homeowners new alternatives. Not only are there more choices than ever, but they are ecofriendly, sustainable and most importantly cost-effective. The average homeowner is now able to enjoy the benefits of metal roofing which include longevity, durability, energy efficiency, and increased home value. Traditional metal roofs were created from a soft alloy known as terne, then covered with tin or lead to provide needed strength. This effectively created roofing that could last a hundred years. In fact, that’s what was used on Thomas Jefferson’s home Monticello. The house in the mountains of Virginia still has the original roof, and it remains in good shape to this day. New options included zinc, aluminum, copper and galvanized steel. Each of these offer specific benefits, so it is important to select the one best suited for you. For example, aluminum is reflects heat better than steel; however it is less resilient. While copper is by far the most durable, it is also the hardest to find and most pricey. The greatest advantage of metal roofing over a composite shingle is the longevity. At a minimum, homeowners can expect a 40 year lifespan, with many lasting over a century. This can be attributed to its toughness and ability to resist the effects of fire, damage from trees and most importantly weather. Hail, wind and rain all have a big impact on shingles, but are easily resisted by a metal roof. This makes metal a great choice for homes in areas that have hot, cold, wet or windy climates. Other benefits include environmental factors. It’s estimated that removing shingles adds 20 Billion pounds of garbage to landfills each year. Metal is a sustainable product for building. The roof can be created from recycled materials, and then be recycled again once its lifespan is complete. Additionally, metal roofs are effective at reflecting the sun’s heat. This can allow the homeowner to save between 10-25% on utilities. Installing a metal roof will increase the resale value of your home. Real estate values can be influenced greatly depending on the market where a property is located. However, metal roofing is correlated across the board with increased home value as well as lower cost for maintenance. It can be tough to keep up with all the maintenance a home entails, but by doing so you save financially in the long run. With the change of season and warmer weather upon us, it’s a great time to get busy on your home. Traditionally, the summer months mean rain in North Carolina. If you’ve been putting off your roof repair, now might just be the perfect time. A metal roof is a great choice for any type of roof, particularly in areas that receive heavy precipitation. Metal roofs can withstand high winds, they shed rain and snow effectively, and they are also fire resistant. Metal roofing is usually more expensive than asphalt, but that investment in your home will pay off long term. 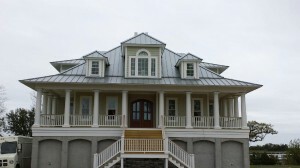 A quality metal roof installed by a skilled roofing contractor may last as long as your house! Metal is also an environmentally friendly roofing material. Harbor Roofing & Siding uses only top quality metal roofing materials. 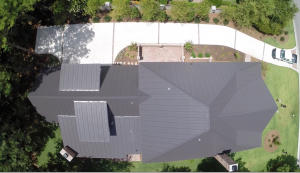 Take a look at our portfolio to see some of the beautiful metal roofs we’ve installed in Wilmington, Jacksonville, and surrounding areas. View our recent metal roofing projects.